The training programs were previously announced for deployment, except for the Dassault Falcon 900 and 2000EASy in Dallas. "We are proud to continue to provide our customers with high-fidelity training programs close to their home base," said Nick Leontidis, CAE's Group President, Civil Aviation Training Solutions. "We are seeing an increased demand for business aviation and helicopter training in the Americas, the Middle East, Europe and Asia." A new Level-D full-flight simulator (FFS) for Bombardier Global 5000 and Global 6000 business jets equipped with the Bombardier Vision flight deck became ready for training earlier this year at Emirates-CAE Flight Training (ECFT) in Dubai. CAE also offers training for the Global 5000/6000 featuring the Bombardier Vision flight deck in Amsterdam. Emirates-CAE Flight Training's Gulfstream G650 simulator will be ready for training in Dubai in the first half of 2016. The FFS is a newly-built CAE 7000 XR Series model equipped with the latest CAE Tropos-6000 XR visual system - it is CAE's first 7000XR Series model of simulators for business jets. The 7000XR Series is CAE's latest generation simulator designed to address new and future training requirements including enhanced instructor station that embrace Upset Prevention and Recovery Training capabilities. The Gulfstream G650 training program complements the network of Gulfstream G450/G550 large cabin training program currently available in CAE's Dallas, New York, London, Dubai and Shanghai training centres. In support to the market demand in North America for the Dassault Falcon 900 and 2000 EASy series, the new CAE-built FFS will be qualified to level-D and ready for training in the fall of 2015. Currently, CAE offers training for the Falcon 900 and 2000EASy series in its New York, London and Dubai training locations. 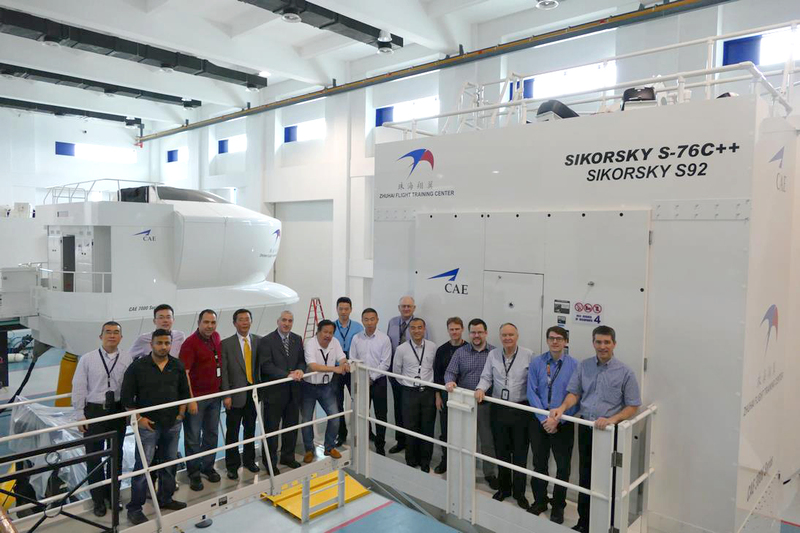 In support to the growing helicopter market in Asia, CAE and China Southern are offering a Sikorsky S92 helicopter training program in their Zhuhai Flight Training Center. The new FFS has been qualified to Level D in March 2015 and is now available for training. This follows a Sikorsky S92 helicopter training program deployed in CAE's Oslo, Norway, training centre last summer. The program is currently available for a variety of mission-specific training but is targeted principally at the Offshore and Search and Rescue (SAR) markets. CAE also offers Sikorsky S92 training in Sao Paulo, Brazil, and Rimba, Brunei. CAE's first Airbus Helicopters H225 full-flight simulator will be qualified to the highest fidelity (Level D) and is scheduled to be ready for training in mid-2015 at the CAE Oslo training centre. The H225 program will offer initial, recurrent, and mission-specific training for the Offshore, Search and Rescue (SAR), VIP and other operating profiles. The H225 training program will provide an unprecedented level of realism for pilot mission training. The CAE 3000 Series simulator, which was developed specifically for the helicopter market, will be equipped with a CAE Tropos-6000 visual system and Airbus Helicopters' original simulation package.